SINGAPORE, May 23, 2017 – Huawei Technologies announced collaboration and partnerships with 20 key industry peers at this year’s Huawei eco-Connect conference, held in conjunction with CommunicAsia 2017. (3) accelerate the region’s digital economy transformation. Huawei currently offers its Cloud Platform to enable customers to build new business models and increase revenue streams in the digital age. Huawei also identifies growth opportunities, and hence the emphasis, on IoT-as-a-Service where telecommunications operators and industry partners will be equipped with a holistic approach to IoT services. Other areas for growth identified by Huawei include Video Cloud hosting services for entertainment, gaming, education and business. OpenLab, and jointly introduced the i5Lab with NUS Enterprise. The collaboration aims to cater to the industry’s needs for incubation of innovative ideas, training, research support, funding, testing and certification in the region. Huawei continues to develop industry alliances and partnerships with businesses, open source communities, as well as developer platforms to unleash greater potential for innovation, as well as promoting the growth and sustainability of the ecosystem. Existing partners such as SAP, i5Lab, Ascent, Itron, Fusionex, Redtone and more form the growing line of collaborators who share expertise, solutions and networks to realise the region’s connected future ambition. To enable the development of an open, conducive platform where the innovation ecosystem players can engage, learn, share best practices, and grow business match-making opportunities, Huawei will be organizing a series of insights-driven platforms such as an IoT Ecosystem Forum, Asia Pacific Telco Content Forum, Singapore Channel Partner Summit, and Smart City Roundtable that gather all key stakeholders of the innovation ecosystem ranging from governments to regulators, operators, developers and content providers. 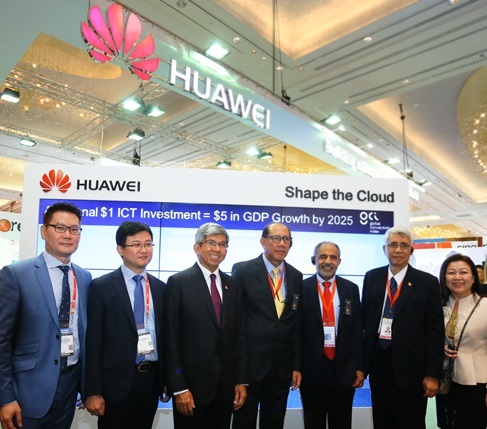 Extending the experience to the CommunicAsia Expo, Huawei and its partners will showcase at its booth cloud applications in business and consumer-simulated environments, as well as the latest IoT innovation in sectors such as utilities, energy, transportation, public safety and infrastructure, as well as waste and drainage management.